There comes a time in a mac owners life when you have to deal with a hard disk failure or at least some corruption due to an improper shutdown like if there’s a power cut or accidental unplugging. Apple’s Disk Utility is fine for the basics but when you need something that delves a touch deeper and sorts out more than just basic disk permissions, Stellar Software’s Mac Volume Repair comes to the rescue. Stellar Phoenix Mac Data Recovery Software Offering was one of our first reviews we did way back in the midst’s of time performing data recovery more than admirably but let down by the UI interface looking incredibly dated given the design centric UI of today’s applications. The Mac Volume Repair Interface wise it’s as simple as you can get. There’s no hidden options or contextual options, what you see below is what you get. and when it’s done it’s stuff this is what you get. Again there’s no log file or any sign to tell you what’s gone on along with no information on how to get out of trouble if you need to roll back. 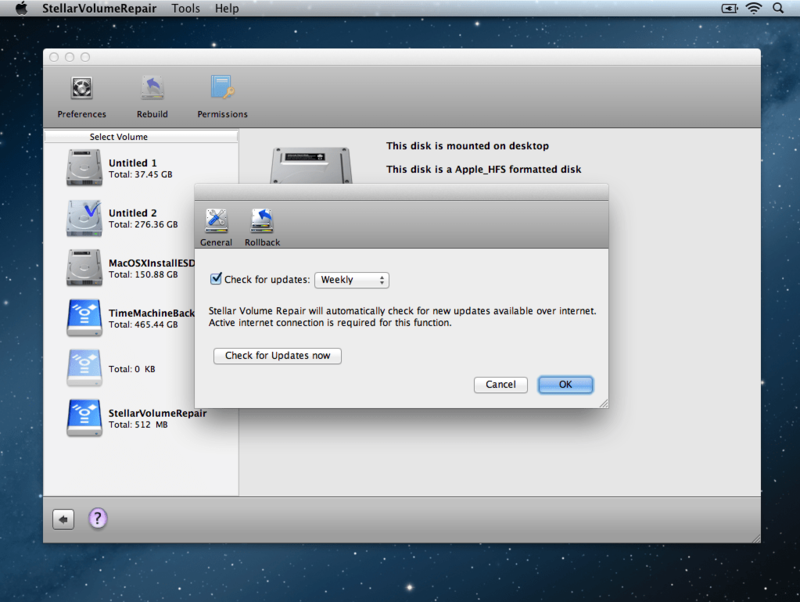 Now let’s run the Apple Disk Utility again to see if there is a change. Granted Disk Utility is more basic but the premise is that after running Volume Repair the permissions should be at least fixed? and viola, sure enough those permissions are now sorted. What isn’t made clear on their website is how Stellar differs from Disk utility but if you head to the bottom of the review they have sent me a list of issues it will fix. If your drive really has got itself into a mess you’ll soon learn that the Apple disk utility won’t always help, at the worst your drive might not even boot and this where a Stellar Softwares offering shines above that whats built in with the shape of being able to create a Rescue Disk. 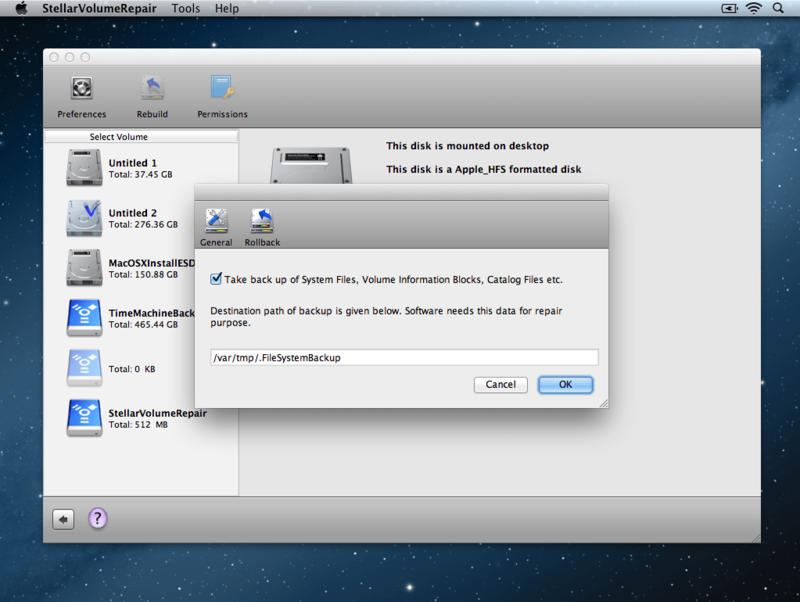 Of course you need to create this before you have any issues but a disk created from a different mac will work. From the tools menu you can swiftly create a rescue cd that gives you the basic permission and repair options as in the desktop version. Word of note here. It won’t recognise a non formatted or non initialized drive. I found this put when using a new, put of the box disk. So in other words there is no partition or initialization tools. All too often we get requests to review software where it’s a one-off process. The software get’s released, promotional duties done and then that’s it no support or, in a worst case scenario, development stops. Stellar responded in a timely fashion to any questions that I had, not only under my review name but a pseudonym I create. Some might call it sneaky but I prefer calling it in-depth. What’s not clear is how it works with Fusion drives. As its part of the core file system it should work things out but our lowly office mac has an old style spinning platter so it remains untested. The only main gripe I have is the lack of “what’s going on” No error logging, timers to give an indication of how long any action will take may leave some slightly unsettled. It’s not obvious till you dig around what the advantages of Mac Volume Repair 1.0 over disk utility is until you start digging. Granted the company’s website does a good job telling you what things do but what it can do. Which is a shame as it does plenty more than Disk Utility. All that in mind it still hits the recommended group as being able to create a boot disk to get you out of a bind is great in itself, it’s just a shame that more time wasn’t spent on the UI as has obviously been spent on the real disk repairing. Stellar Volume Recovery is priced at €39 and a free trial is available for download as well. Following errors are covered by Stellar Volume Repair over Disk Utility.